Get one item for free at Canadian Bath&Body Works stores. Print the coupon, bring it to your nearest Canadian Bath&Body Works store, show it to cashier during the time of your purchase and get one item for free with a purchase of $10 or more. 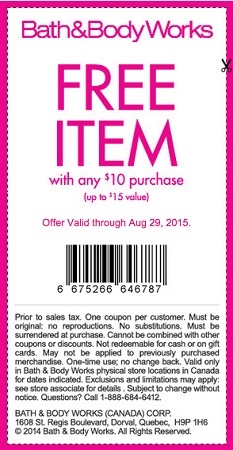 Offer is valid through 08/29/2015. Official source of the information is Bath&Body Works Canada. More information about the promotion available at Canadian Bath&Body Works stores.